In 1992 Jenny Newman started teaching fiddle classes in Cosgrove. At first, group classes took place in Newport Pagnell and neighbouring places with suitable halls. 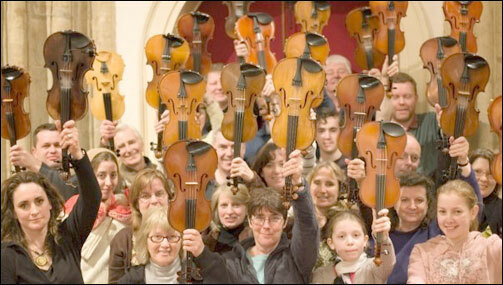 Jenny and her husband Andy Glass began to hold Fiddle Workshops in the Village Hall in around 1997. They ran Barn Dances in aid of Cosgrove Church and later, as their own children came along, for Cosgrove School. They recorded some of their professional work in Cosgrove Church, notably Jenny’s album “Tom’s Fiddle” published in 2000 and “Red Moon” in 2006. When the Upper Room was completed in Cosgrove Church in 2001, Jenny moved Cosgrove Fiddles there and in 2014 they still meet there on Tuesday evenings. Their performing group “The Big Fiddle Band” rehearse in the Church itself, and make concert and busking appearances for churches, including Cosgrove, charities and street events such as Stony Stratford’s Folk on the Green, Northamptonshire’s “Music in Strange Places” and Great Linford Waterside Festival. They make an annual appearance at the Fiddle Festival of Great Britain. 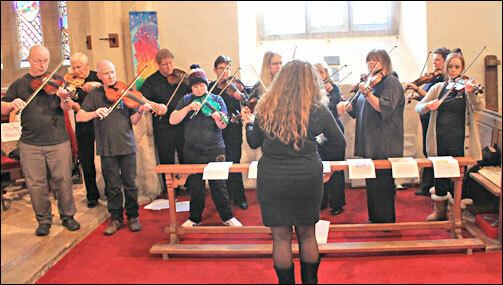 On 1st March 2014 The Big Fiddle Band played English tunes at the launch of the Cosgrove History website in the church.